Moving from the 'wee school' to the 'big school' was a big step. Although there was easy access between the two buildings I don't recall us 'wee ones' venturing into the big play ground, and vice versa, and of course in those days no one was allowed in the buildings at playtimes (except in unusual circumstances). So it was all new to us little ones moving up. If the weather was bad there were the sheds to shelter in, which were three sided affairs with tin roofs. The driving rain often invaded the so called shelters and children tried to get as far back as possible. There was even separate sheds for boys and girls. The big school had separate entrances for boys and girls, I believe it was carved in stone above the main doors. Each class queued up in orderly lines when the bell went and Heaven help you if there was any noise after the bell. Many times, children would be seen running down the hill from Livingstone Street when the bell was ringing: to be late was not a good thing. The big school held three main classrooms along the same side of the corridor as the entrances. On the other side was: the staffroom, girls pegs, a great gym hall, boys pegs and the heads study. Room one was where grades three and four were taught. The teacher in 1952 was Miss Arnott, who I believe was at Addiewell for many years. She lived in West Calder and came to work on the bus. The two grades were split down the middle of the room. There were (I think) four vertical rows of double desks with five in each row. Making forty seats, approximately twenty children per class. The desks had two seats that folded up on a hinge and I can still hear the squeaking metallic sound as they were folded up and down. Likewise the lids, giving each child an individual space to place their books and pencil cases. The wooden tops were well marked by generations of former pupils, some of whom were the parents of the children now using them. Did it do us any harm to use such old furniture? I certainly don't think so. Beyond the lid was a groove to lay your pencil in, and in the right hand corner a hole that held an ink well. Now there's a memory! The only books we carried home were our reading and spelling books and all the jotters were kept in the store cupboard and handed out when needed. Pencils were handed round and collected up after class. 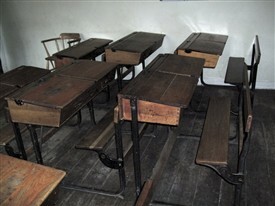 Later children brought their own, sometimes in wooden pencil boxes made by big brothers in woodwork at the high school. We were not allowed pencil sharpeners because there was a fancy rotary one attached to the teachers desk and she would decide if your pencil needed sharpening. The same went for erasers; if you made a mistake you had to raise your hand and trip out to the front of the class to have it erased. What was that all about? Our homework, at this stage, was a bit of reading and ten spelling words. Next day we were required to write these words in our spelling jotter (exercise book). They would then be corrected by Miss Arnott with her correction pens, one red and one blue. Guess what the red one was for... Arithmetic was not a word we used and Maths was something done in high schools. No - we did sums. Our jotters had pages all covered in squares, making it easy to separate the numbers. We had done a bit of adding in the infant classes but now we faced: take away, multiply and divide. No fancy names for us! In later classes we tackled long division and LSD (for the uninitiated that's pounds, shillings and pence, in other words, counting money). I don't know why the pence was represented by a small d. The teacher would write the sums on the blackboard and while half the class toiled over them the other half would be reading aloud. This was very distracting but we were stuck with it. But worse still was if the other half was chanting tables. Total confusion for me. We did learn a lot by rote and I suppose some of it must have stuck. This page was added by Margaret Foster on 17/10/2012. Our next step after these Addiewell schools was going to West Calder schools. Here we met strangers who lived in Cauther, Polbeth, East and Mid Calder and the surrounding villages. The Addiewell pupils used to stick together at first but gradually we made more friends. Now we had to cope with Science, Needlework, Cookery and Foreign languages, to mention a few, but we managed to get through it all- some more successfully than others. The strictness of the schools was much the same as Addiewell and we dared not talk back to a teacher. Your memories of the school days are really accurate, comprehensive and much enjoyed! Keep 'em coming. Yes, moving to high school was another chapter of our lives about to start. You are right about meeting new people, (from all these exotic places lol). I suppose it helped broaden our horizons and gave us a sort of independence away from what had been our home ground for so many years. The start of our growing up perhaps. Add your photos and memories here of Graham Street.